It was springtime in 1965. My fiancé and I were soon to be married. Most of the arrangements had been made and we were looking for Ted Scott to book the hall for our wedding reception. As we approached his front door, he greeted us with the words “You’ve come to see the orchids, haven’t you?” “Well, er, no, we’ve come to book the hall for our wedding reception”. “Never mind, come and have a look, anyway”, said Ted. I don’t know whether he would have allowed us to book the hall without seeing his orchids first but he was intent on showing them to us. 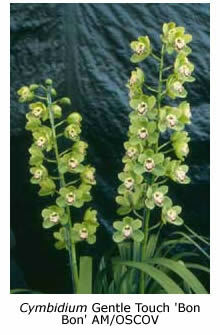 That was my introduction to orchids, which I now know were cymbidiums. Nothing orchid-wise happened for the next ten years until my wife and I became friends with a couple from the local garden club. They grew a few cymbidiums among their pot plants and I bought one. A week later another joined it and I was addicted. Not having seen many orchids, I snapped up every one that I came across like the rarity I thought it was! 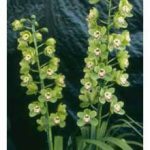 That is, until I joined an orchid club and came to realise that what I considered to be desirable rarities were mostly age-old rejects, family heirlooms and clones of Cymbidium lowianum. One becomes more discerning with time. My next batch of plants came from various growers including John Jansen in Modella, Hodgins Orchids at Frankston and Lindsay Leamon in Drouin. Such exciting new seedlings as Cym. (Wallara ‘Gold Nugget’ x Wyel ‘Gold Kedron’), Cym. ( Sylvania ‘Crimson Glory’ x Warella ‘Patricia Joan’) and Cym. (Khyber Pass ‘Red Splendens’ x Alnwick Castle ‘ Dover Heights’) changed hands and were carefully nurtured and pampered. Cym. Sussex Dawn ‘Dorothy May’ and Cym. Rosanna ‘Pinkie’ seedlings also featured in my growing collection. One of my proudest possessions was Cym. Hawtescens FCC – there was something fishy about that one, I suspect. Two possibilities come to mind – either the plant was awarded a First Class Certificate outside Australia and its clonal name was omitted, or FCC was an abbreviated clonal name for something like ‘Fine Coloured Clone’. By today’s standards, its only good feature was its clear, yellow colour. I’m unsure whether it was passed on to others or went to heaven because I eventually parted with all except two of my original cymbidiums. For sentimental reasons I’ve retained a piece of Cym. ( Khyber Pass x Alnwick Castle), now named Cym. Booborowie, and an apricot-flowered seedling, Cym. (Warona ‘Apricot’ x Canara ‘Wondabah’), now registered as Cym. Terrigal. This was the era of diploid and triploid cymbidiums. But about this time (1975), hybridisers realised that the future of cymbidiums was in tetraploids. Diploid clones could now be converted to tetraploids, thus eliminating the infertile triploids that result from interbreeding diploids with tetraploids. Flower shape, substance, colour and lip quality can now all be made to design, in theory. Cymbidiums have come a long way in the quest for man-made perfection. However, I feel that one quality has deteriorated and that is the presentation of the flowers on the stem. Turned-in flowers or bunching often ruins the appearance of what is otherwise a perfect cymbidium. 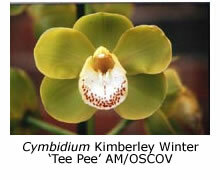 With so many hobbyists growing cymbidiums, it is disappointing to see so few plants awarded. Many cymbidiums at shows and monthly meetings have ‘award potential’ but seldom seem to ‘make it’. There are several reasons for this, one of the main ones being that the plant is never grown to its full potential – a plant has to be well grown to flower well. 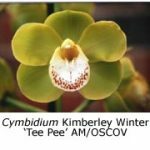 Despite all the ‘experts’ heard as guest speakers over the years, many hobbyists still have trouble in growing cymbidiums well. Experienced growers really should not have problems with such things as ‘red spider’ and root loss, two conditions that result in poor flowering. Provided that the grower has a collection of manageable size and is willing to squirt the underside of the leaves with a jet of water every week, spider mites (‘red spider’) will not be a problem. Many speakers advise against watering over the leaves in hot weather, on the grounds that water will lodge in the leaf axils and cause burning. From my experience, no matter when you water, some will lodge in the leaf axils because nature designed them to be water-tight. Fresh water replaces the stale and stagnant water already present – and just how hot does it really get there, anyway? Major root loss is often the result of the development of acidity around the roots and the accompanying growth of anaerobic micro-organisms which rot any living tissue available, in this case, orchid roots. The addition of builder’s lime will counteract the development of acidity and keep the potting mix ‘sweet’. A periodic dusting with lime is all that is needed. How much and when? Now, that is the same as asking “how often should I water?” You will have to learn by experience because everyone’s conditions differ. As a guide, some lime should be added in late autumn. If you want to know more precisely how acidic your potting mix has become, you can invest in a pH test kit for a few dollars. I water the plant in the usual way and after a few minutes (when almost all free water has drained away) tip the pot and collect the last of the drainage water in a test-tube. Add a drop or two of the indicator fluid, shake and then compare the resultant colour with that of the test chart to measure the pH. Also test some of your tap water, to determine how much acidity (if any) has been contributed by the potting mix. A pH range of 5.5-6.5 is regarded as acceptable for most orchids but your orchids will begin to suffer at lower pH levels (that is, under more acidic conditions). In this case you should either repot in fresh mix or adjust the pH of the old mix by soaking the pot in a slightly alkaline solution. Don’t overdo it. Dissolve a level teaspoonful of builder’s lime in a bucket of water and stand the pot in this solution for 20 minutes. To treat the whole collection, dust the surface of the pots with lime and water it in. Alternatively, if you have a proportioning pump, apply diluted lime solution to your collection over several sessions. Use the pH test kit to check whether you have applied enough lime. Fertilisers should not be applied at the same time, because some of their active ingredients will be rendered insoluble and therefore unavailable to the plant. During hot summer weather in my home town (Moe) our tap water may become alkaline, probably because the local council adds excessive lime in conjunction with its chlorination program. If an orchid potting mix becomes alkaline, fertiliser is no longer available to the plant and its growth becomes stunted. It is therefore necessary to apply an acid. I don’t know what is available horticulturally, but in my experience diluted vinegar works well. Application may be either with a proportioner or the old-fashioned watering can. Enough acid has been applied when the test kit indicates that the mix has reached pH 6. I have found that a pH test kit is a good investment. You will be surprised how acidic an orchid mix can become over time and how much better your orchids will grow if you neutralise that acid.